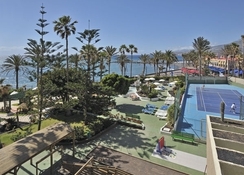 Sol Tenerife Hotel is a luxurious, family-friendly property located at Troya beach in Tenerife’s Playa de las Américas. Tenerife has rugged volcanic mountains, quaint villages, exotic theme parks and miles of golden yellow sands. No wonder, it has emerged as the one of the top choices for summer holidays for families, travel groups, couples, newly-weds and single travellers. The non-smoking hotel provides a comfortable stay to all its guests with a host of modern amenities and services. The modern rooms offer amazing sea views and come fitted with all necessary amenities. An a la carte restaurant, two lovely bars and three outdoor pools, an array of facilities for sports and recreation, musicals, evening shows and live music make Sol Tenerife Hotel an ideal retreat for a fabulous Tenerife beach holiday. 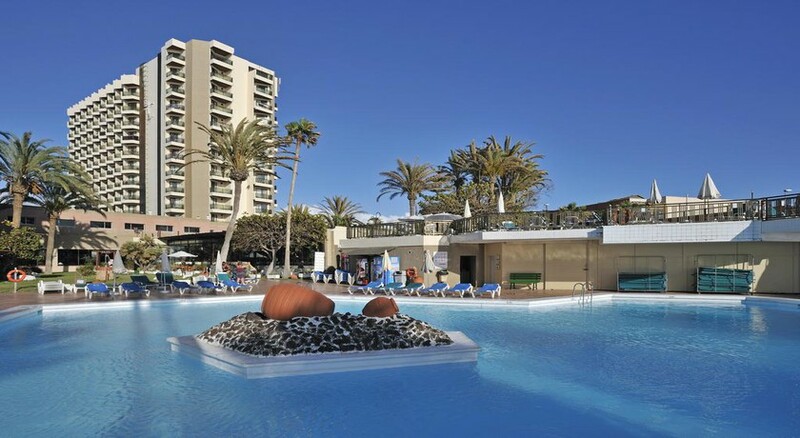 Sol Tenerife Hotel is located just 200 metres away from the lovely beach in Playa de las Américas, Tenerife. Theme parks such as Siam Park, Aqualand and Jungle Park are a short distance away. The beautiful golf course of Golf Las Americas is just a km away. For those interested in shopping, the San Eugenio shopping centre, 1.5 km from the hotel, is the perfect place to get great deals. 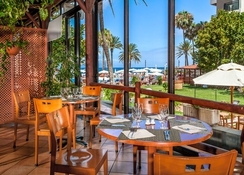 Hotel Sol Tenerife has air-conditioned well-furnished rooms that offer sea or mountain views. These are furnished with satellite TV sets, double or twin beds, telephones, refrigerators, desk, chairs, hairdryers, minibars, safe deposit boxes, and Wi-Fi facilities. These rooms are brightly painted and have tiled floors. 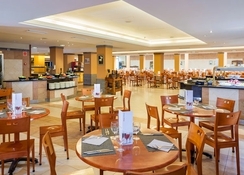 Hotel Sol Tenerife has an a la carte restaurant that serves a hearty buffet for breakfast. Options include Mexican, Italian and local cuisines. There are three bars, including a main bar, a lounge Bar and a pool bar that serve various alcoholic and non-alcoholic drinks. 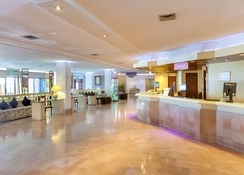 Hotel Sol Tenerife offers many sports and recreation opportunities to its guests. Three outdoor pools, including one heated and one for kids, along with a spa, a gym and a mini market. There are facilities for sports like tennis, table tennis, volleyball, billiards and bowling. Kid can have fun at the kid’s club with interesting activities like treasure hunt, inflated castle and pirate parties. Lovely hotel - would definitely go back! We went on a couples holiday and had such a lovely time at this hotel! Our room was on the 9th floor so we had an incredible view over the ocean with the afternoon sun on our balcony. The staff were friendly and helpful and we were surprised by how great the food was. We went half board so we had breakfast and dinner included. The buffet was huge and the food was different each day, so there was always something to choose from. The hotel also had entertainment on each day/night which was great fun for those evenings we decided to stay in. The only negative thing for us was that our room was facing the strip, so the music was very loud. Even with the balcony door closed it was still loud enough to be annoying when trying to sleep, so bring earplugs just in case! The only negative comment I would say is that my friends that were also in the area at the time was not allowed in our hotel room because they wasn’t a guest there. Also it is quite noisy from all the clubs at night but this didn’t bother me at all. Other than that everything was perfect! Weather wasn’t brilliant so didn’t get to use the pool, but looked clean and tidy. Very close to the strip so very noisy at night. Lively hotel situated right on Veronica's strip so don't expect a peaceful sleep! Good location to beach and down the road from plenty of bars and restaurants shops and the beach. Lovely pool area and me and my mum loved the buffet lunch! Didn't have dinner as we chose to eat out every night. Hotel was clean constantly and reception staff were lovely and very helpful. Drinks weren't the best so I found myself buying my own from the shop nearby but other than that good value for money and good if you are looking for a lively holiday if you looking to relax and get a good sleep I'd avoid! If your young and looking to be in the heart of it all then this is the hotel for you, food not bad more like 3 star to be honest, but still nice! Room and staff nice, only very noisy at night, the club over the road stopped playing music un till 6am in the morning, so not good for families looking to settle children down but ace if you want to party all night.